It’s mid-week following our return from Autumn Camp 2018. We camped for the weekend at Pinsent Campsite in Winchester and as those attending knew, as the leadership team at Phoenix Explorers, it was our first camp. On camp with us was a Nights Away Assessor, assessing our preparations for and running of camp with the view to gain our own Nights Away Permit within Scouting to allow us to run our own events in the future. The weekend got off to a potentially shaky start with Storm Callum threatening to derail our plans for a peaceful weekend, however, the south didn’t fare as badly as other regions of the UK which meant that forecasts showed some strong gusty winds but nothing we couldn’t handle. The pitch we had selected and booked at Pinsent Campsite was well sheltered with trees and a hedge-line which meant we were well protected from the elements in our camp. On this camp, our first camp together, we took a light-touch on activities and instead, put the focus on essentials like food. One aspect of Scouting that I enjoy is togetherness and for Phoenix Explorers, this includes the leaders. 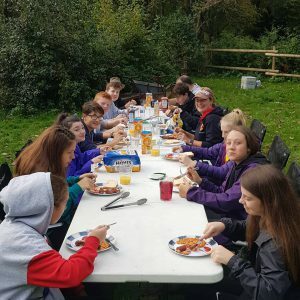 All of the meals we ate on camp, we cooked and ate together with the leaders eating the same meals as the Explorer Scouts, cooked by the Explorer Scouts. On Friday night, we enjoyed chicken fajitas with some extras on the side and it was great to be able to share this first meal together. Saturday morning we had a classic English breakfast and what camp would be complete without one. 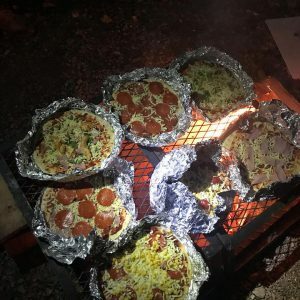 Saturday evening, we tried something new and made our own pizzas and cooked them on an open fire with loaded potato skins for starters – definatly one that we will see on the menu again I think. Breakfast or bunch? Explorer Scouts don’t like early mornings. We were very lucky with the weather on Saturday with blue skies allowing us to take full advantage of the pioneering activity we had arranged. The weather on Sunday was not so great with a heavy downpour in the morning but luckily, it held back later and mostly stopped by the time we broke camp and packed our kit but that wasn’t enough for it to come home dry sadly. No camp would be complete without a campfire and on Saturday night we enjoyed a hearty fire together which lasted well into the night. On Sunday, before we finished breaking camp, we held a short Scouts Own giving us all time to take a moment of reflection together. This is the first time I have ever participated in a Scouts Own with young people and the first time I have ever run one too. I hope that the Explorer Scouts on camp found the experience positive; as a team, we agreed that it was a worthy addition to the camp and we will plan to incorporate these into our camps and programming in the future. Trying something new: open-fire homemade pizzas. As a leader, I had a fantastic time even with the weather on Sunday. It was great to get to see the Explorers in the real outdoors camping for the first time and I really hope that everyone had as much fun as I did and I cannot wait to get out another camp. As a team, we were tried and tested on a couple of occasions but we followed our processes, stuck to our plans, and at the end of it all, we accomplished our goals and came back feeling immensely positive. I want to express a massive public thank you to the other leaders who attended the camp with me as it’s not a solo effort and it’s a team that makes the experience memorable. I also want to thank not only the Explorer Scouts who came but also the parents and families of those Explorer Scouts for putting their faith in us as leaders and letting them attend the camp with us. The important takeaway is that we accomplished our goal. Our Nights Away Assessor on camp validated everything that we had achieved and rewarded me with my Nights Away Campsite permit. This milestone means that I am now qualified to run camps for our Explorer Scout Unit both indoor and on campsites. This achievement allows us not only to think about undertaking more camping activities but also means that we have more autonomy to run these camps. Always looking ahead, I do not plan to end our journey here. My goal for Phoenix Explorers is for us to be able to undertake even more adventurous camps and I will be looking in the future to get the Campsite permit upgraded to a Greenfield permit. With a Greenfield permit, this means that we would be able to camp in more remote areas off the beaten track and enjoy different experiences. There isn’t a timescale for doing this and it’s not something I want to rush into either; I want to be certain of our abilities as a Unit and leadership team in running camps both Indoor and on Campsites before we go down the Greenfield route. This all ties with what I described to our Explorer Scouts and parents earlier this year when I described how we plan to start small and scale up and grow into it together. I hope this camp and also this post has inspired our Explorer Scouts who weren’t able to join us this time to join us next time. if you aren’t already with us and you like the look of what we do, why not join us? This entry was posted in Events and tagged Autumn Camp, Camping, Nights Away Permit. Bookmark the permalink.